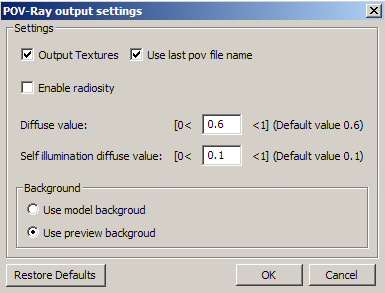 Output Textures - provides possibility to output or ignore texture coordinates. Use last pov file name - if check box ON - last POV-Ray file name will be used for export. Enable radiosity - if check box ON - radiosity block from POV-Ray help will be outputted. Currently no more management provided. Diffuse value - value used for 3ds file materials which have self illumination flag OFF. Self illuminate diffuse value - value used for 3ds file materials which have self illumination flag ON. Very few 3ds models uses this flag. from any light sources is reflected via diffuse reflection. means that 70% of the light seen comes from direct illumination from light sources. The default value is diffuse 0.6.